SANTA's WORKSHOP ADVENT CALENDAR - Help Santa assemble all the toys as he makes his list and checks it twice! Contains twenty-four surprise items for each day of Advent to form a gift. Once all the pieces are revealed, experience even more fun with the bonus PLAYMOBIL memory game. HIGH-VALUE, QUALITY PLAY PRODUCTS - Figures can bend, sit, stand and turn their heads! MAKES A GREAT GIFT - This PLAYMOBIL Playset is perfect for saving time, money, and headache while doubling the fun for children. It will make a thoughtful gift for any young boy or girl! CREATIVE ROLE PLAY WITH PLAYMOBIL - PLAYMOBILas unique play principle stimulates imagination and creativity and thus promotes child development. With PLAYMOBIL, children can not only slip into many different roles, but also recreate and experience the world in miniature. 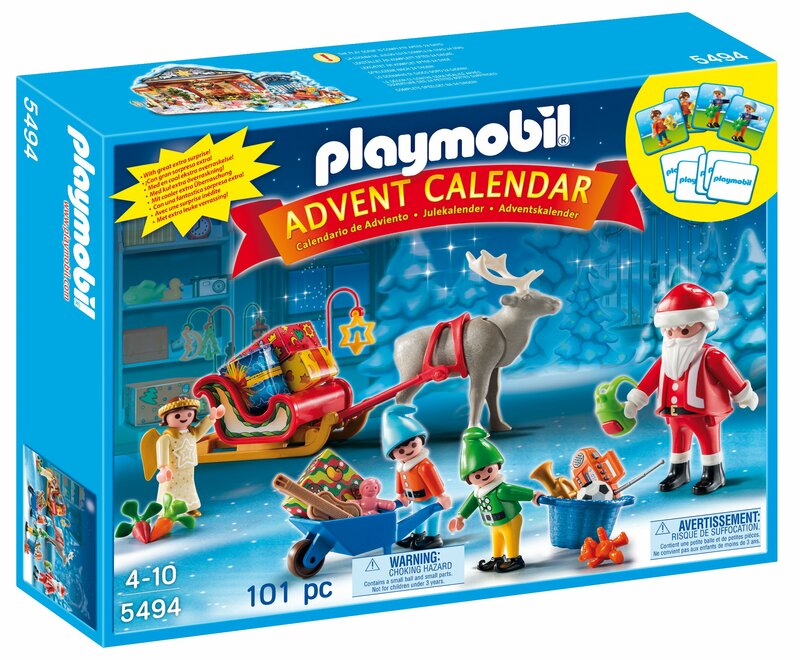 SPECIFICATIONS - Playset includes Santa figure, two elves and one angel figure, and additional accessories. Recommended for ages 4 and up. Product Packaging:Frustration-Free Packaging Help Santa assemble all theChristmas gifts as he makes his list and checks it twice! The Advent Calendar"Santa's Workshop" contains twenty-four surprise items for each day of Adventto form a gift that will keep on giving long after the holidays have passed.Set includes Santa figure, two elves and one angel figure, reindeer withsleigh, gifts, assorted toys, wheelbarrow, basket, and additional accessoriesto build a complete Santa's Workshop. Once all the pieces are revealed,experience even more fun with the bonus PLAYMOBIL memory game. Recommended forages four to ten. Playmobil, Germany's largest toy manufacturer, isheadquartered in Zirndorf, Germany and has been producing and distributingtoys for more than 36 years. The miniature worlds of Playmobil encouragechildren to explore and learn while having fun. Children's imaginations aretransported to medieval times with the Playmobil castle, to the adventurousseas with Playmobil pirates, and many other themed playworlds. The figures canbend, sit, stand, and turn their heads to make realistic role play possible.